Who among us hasn’t told a little white lie? You know, like telling your boss you were late for work because of traffic. When in reality you spent 15 minutes waiting in line at your favorite coffee place to get a caramel macchiato before work. Housewives, in some ways, are no different than the rest of us. They occasionally tell lies-sometimes big and sometimes small. 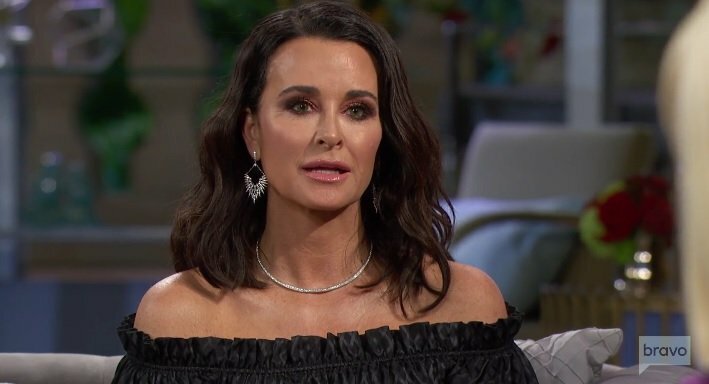 In an interview this week, the Real Housewives of Beverly Hills’ Kyle Richards talks about the new season. She says it’s all about deception. Which seems like a good basis for an interesting Real Housewives season. Hmm…Lisa Rinna has always been honest about what’s in her pill bag, right? Dorit Kemsley wouldn’t lie about anything, would she? Erika Jayne has always been ready to take a lie detector test to prove her honesty. Lisa Vanderpump owns up to all of her transgressions…or so she says. I know: it must be Teddi Mellencamp Arroyave that Kyle is talking about! The fracture in the Lisa V and Kyle friendship makes me a bit sad. I always thought of these two as a real-life Laverne and Shirley. Who drive Bentleys. And carry Hermes handbags. Through it all, their affection for each other has seemed genuine. I’m hopeful that the two of them will be able to repair their friendship. And head out for a night of bowling together. Just like Laverne and Shirley. The new season of The Real Housewives of Beverly Hills starts on Tuesday, February 12th. This is the show that got me started on the Real Housewives and changed my television viewing habits forever. TELL US-WHO DO YOU THINK KYLE IS TALKING ABOUT WHEN SHE MENTIONS DECEIT? DO YOU THINK KYLE AND LISA VANDERPUMP WILL REPAIR THEIR RELATIONSHIP? WHICH BEVERLY HILLS HOUSEWIFE WOULD YOU TRUST THE MOST? OR THE LEAST?